A Vanishing Glow by Alexis Radcliff. CreateSpace; 2015. 346 pages. Ebook. Prior to the email I received from Alexis Radcliff, I had never heard of this book or the author, so I was in uncharted territory, something that can be either surprisingly pleasant or decidedly unfortunate. After reading the synopsis provided, however, I was definitely intrigued and knew that I would be reading this book - and it turned out even better than expected! Quick note: this book is one of those where it's hard for me to discuss it too extensively for fear or revealing any spoilers, so I will try to be as detailed yet spoiler-free possible so as to avoid revealing anything too important. A Vanishing Glow is set in a land that is spilling over with revolutionary vibes and political unease. Jason Tern arrives in Ghavarim in order to become Lord Tern, the right hand man to his childhood friend and soon to be crowned king, Nole Ryon. Meanwhile, Nilya has joined the Crimson Fist as a sapper, where she ends up embarking on a journey never expected with a companion she did not ask for. To begin, if there's anything that Radcliff does really well, it's create and develop characters. As mentioned above, Jason is a young noble who travels to Ghavarim where he is about to become Lord Tern. What I really appreciated about Jason was that although he was an extremely intelligent, observant, and resourceful man, he certainly had his flaws. Jason is, to be blunt, a bit hotheaded and tends to let his emotions guide him at times, which I found to be very authentic and a common manner for many people to act in intense situations. At times, I felt somewhat annoyed with him, for he came off a bit overly confident and overly bullheaded at various points throughout the story, so I was actually glad to have that bit of complexity. Nilya is a fierce woman intent on creating and doing big things with her talent; she wants to stand out and be respected. When we are first introduced to Nilya, we see only her intelligence, stubbornness, and determination - which are all great qualities, though somewhat one-dimensional. However, as the book progresses we are privy to much deeper mental struggles that Nilya deals with, creating a wonderfully well-rounded and intriguing character. I was very intrigued by Nilya, for as bold and determined as she is, she's also very sensitive and compassionate; she knows where her principles and morals lie, and she tries hard to stick to those. Radcliff does a wonderful job of weaving in a mixture of fantasy, tech, steampunk, and political intrigue into this delightfully fresh and exciting book. I loved the mix of technology and steampunk mechanisms with magical elements, as it's something that I've rarely - if ever - had the opportunity to experience before. Radcliff has created a very vivid and extensive world, filled to the brim with political scandal and intrigue. There are twists and turns at every corner; Radcliff definitely keeps you on your toes, which made for an exciting trip. Now, I tend to get a bit muddled up in fantasy novels that have a vast amount of politics, unique world intricacies, etc. (here's looking at you, Steven Erikson), but Radcliff did a very nice job of creating and conveying her creation in a readable and enjoyable manner. One of the aspects of this novel that was most interesting to me was how the relational and sexual aspects of society operates. Until a man and woman are 'joined' (which I assume is basically the equivalent of our marraige? ), they do not have any form of relationships with those of the opposite gender as we normally do, but instead have 'bedfellows' with those of the same gender. If you were involved in a heterosexual manner with someone who you are not 'joined' to, you are referred as a 'breedlust,' and this is extremely frowned upon. I'm really hoping that subsequent books delve a bitter deeper into this world and its customs! 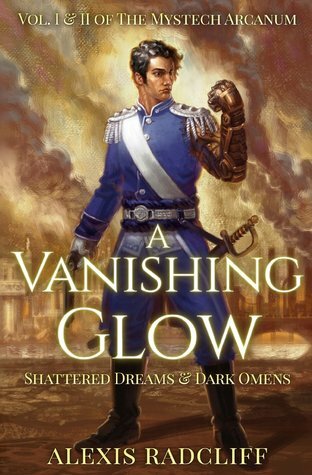 I can certainly see where this book could use some development, but on the whole I felt it was a very solid, intricate, and engaging story that any fantasy or steampunk fan would enjoy. There are so many places and ideas that Radcliff can and will hopefully explore in any subsequent books, so I will definitely be sticking around to check out the next book in the series! Overall, A Vanishing Glow provided a thrilling and entertaining ride through a well-developed land with many diverse characters, and for that I am giving it four stars. As stated above, I would recommend this for anyone who likes fantasy, steampunk, or simply a entertaining book with interesting and unique story lines.